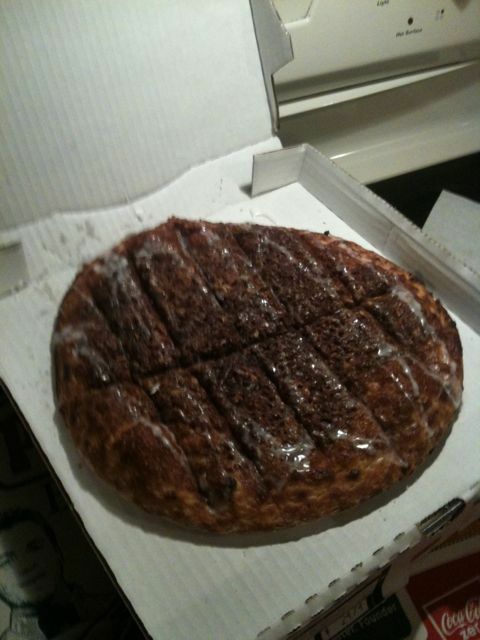 So I just ordered one of these Cinnapie’s from Papa John’s and was very disappointed to see the icing already added. I’m not sure if they compare themselves to their competitors but every where else puts the icing on the side. On top of that I thought ordering Extra icing would mean I would get a package of icing on the side to dip the slices into. The woman at the register told me no, they just put extra icing on it. Well now I am home and I don’t see much icing on this cinnamon pie. I’m afraid to find out how much icing they put on these things when you don’t order Extra icing LOL. Update: Heather just noticed the coupons on the pizza box expired January 31, 2010. I think the owner needs to stop showing off his Camaro in his TV commercials and do an episode of that Undercover Boss show to get his ship back on track.